DIY - Snowmobile Drag Race fundraiser! 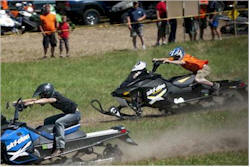 than 70 riders of all ages and skill levels brought out their snowmobiles in the hot summer sun for the two-day event. They raced on a 500-foot stretch of grass in a hay field, sometimes nearing speeds of 100 miles per hour. Riders said the unique community event allowed those who spend countless hours and thousands of dollars on their sport to enjoy it any time of year – not just when the temperature drops and the snow falls. The snowmobile is a symbol among the residents of the small town along the St. Joe River and a part of the unique outdoor culture created there. They started with about 40 participants, and this year more than 70 registered, many coming from outside the area. Because snowmobiles need the snow to cool them down, after a match in the days heat, the riders would drive their snowmobiles onto a cooling station, where cold water was cycled through to keep them from overheating.